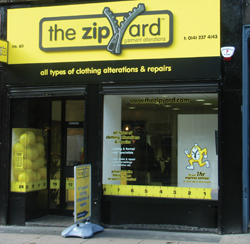 The Zip Yard prides itself in highly visible and bold branding. This deliberately strong branding separates us from our competitors and helps us to dominate in the high street. We believe in our product and we feel that we are well on our way to making The Zip Yard brand one of the most recognisable around. As well as our unique branding, all our outlets are finished to the highest of standards and include ‘state of the art’ machinery, computer system and, in most cases, our seamstresses work in full view of the public so customers can see for themselves the high standards of workmanship. You are partnering with a successful company with a proven business model in a growing sector. You will enjoy being your own boss yet you will have all the support of The Zip Yard Management Team. You do not need to have a background in the garment alterations industry as full training will be provided. Furthermore, we will assist with finding the right premises in the best location, as well as recruiting and training staff. 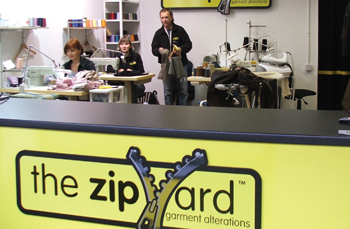 In 2010 The Zip Yard was presented by the Limerick City Enterprise Board the award of ‘Business with Best Growth Potential’.